Are you still annoyed with knee pain? Our Infrared-heating knee massager wrap support is a good choice for you. It is made of high quality material, which is safe and comfortable to wear. The soft self-adhesive pad with high elasticity that is easy to take on and off. Thermotherapy, also we called it heat therapy, is a use of heat in therapy for muscles, chronic pain or stress. It dilates the blood vessels, stimulates blood circulation and reduces muscle spasms, alters the sensations of pain. It is now commonly used to smooth pain and relax muscles. Heating Pad with Hot Pack is an ideal pain relief solution providing hot therapy options. Ideal for knee pain as well as the leg and arm. Heat therapy helps dilate blood vessels, promotes blood circulation and reduces muscle spasms, relieves pain caused by knee dislocation, knee fracture, knee arthritis, surgery pain and swelling. Knee Heat Massager provides powerful vibration massage, help reduce joint pain, muscle stiffness and joint swelling from knee, shoulder, arms and legs, and improve your range of motion. Advanced Selectable Heating function boosts circulation, keep knee warm in seconds, and further relieve muscle soreness and cramps. FAST-HEATING ELECTRIC KNEE PAD: Heats in seconds, provides ultra comfy hot therapy for knee arthritis pain relief and injury recovery, keeps knee warm, can also be used on calves, thighs, arms to relieve muscle soreness and cramps. Super comfortable for use. DEEPLY PERNERATED HEAT to YOUR KNEE PAIN: Our heated knee pad uses graphene heating film as heating element, who generates far infrared heat wavelength to activate nucleic acid proteins and other biological molecules inside our body cells to provide deep physical therapy. HIGH-QUALITY MATERIAL & ERGONOMIC DESIGN: Use of quality fabric and flexible Velcro make the knee heating pad could adapt to your leg tightly but harmless to skin. It could make you feel less sore with excellent support and ensures the effectiveness of the therapy with adapting to your leg perfectly. 1 BUTTON CONTROL AND 3 HEAT SETTINGS: Very easy to operate, you can control the heating temp and time totally by yourself. The power button with LED indicator, it can be operated to red-highest, white-medium, blue-lowest temp setting. Short press the button for once can change the heating setting. Perfect for relieve muscular aches and joint pains associated with overexertion, strains and sprains as well as pains associated with arthritis, meniscus, osteoarthritis, bursitis, ACL PCL MCL tear etc. Also perfect for outdoor activity such as hiking, cycling, sunning, soccer etc. ADJUSTABLE AND STAY IN PLACE: Two bifurcate straps design, hook and loop closure, the heating pad can wrap around and be locked at any leg or arm positions where you need heat compress, you needn't to hold it by hand any more. With a built-in mash bag, put a ice bag in, you can use it for cold therapy if needed. COMES WITH USB CORD: The USB cord is for portable use, it can be plugged in any power supplies with usb port, such as power bank, PC, laptop, desktop computer, car charger. 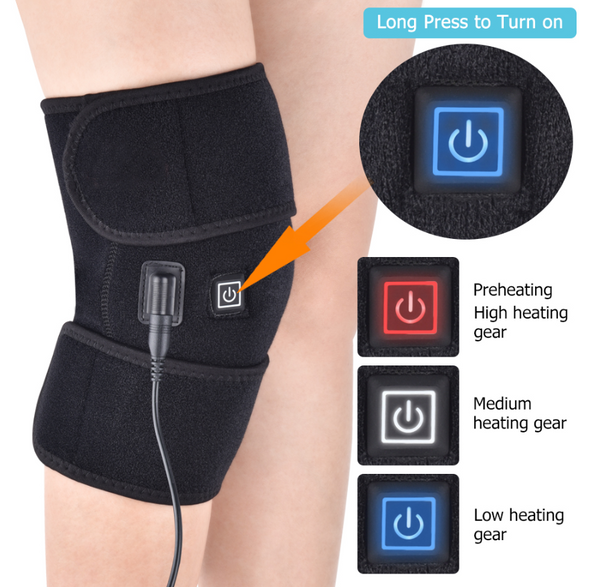 TRAVEL SIZE AND LONG POWER CORD: This knee electrical heating pad is portable, easy to put it in your suitcase or handbag.The power cord is about 6.6 feet (2 meters) long enough to allow you move freely when connect it to a socket. Fits a leg or arm circumference less than 21 inch. Buy 2 if you need 1 pair.